The Jamaican croton (Codiaeum variegatum) is a popular tropical houseplant that’s prized for its bright-colored foliage. 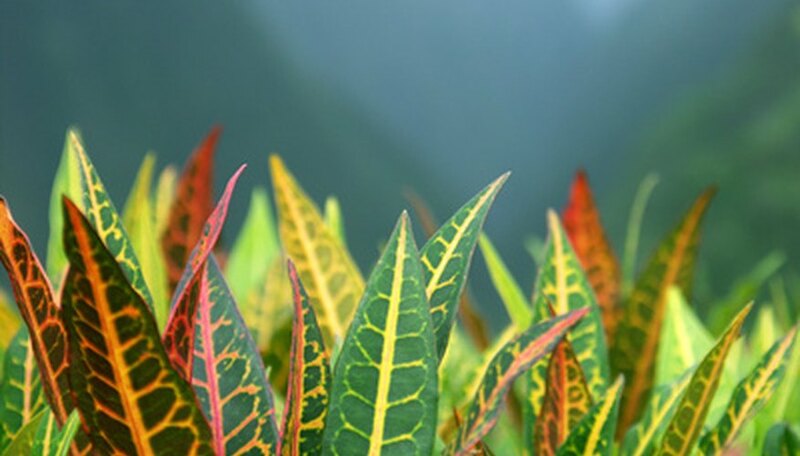 The croton’s leaves are a mixture of green, yellow, pink, red and orange hues. The croton is grown outdoors only in warm regions, but is mostly kept as a houseplant due to its cold-tender nature. Caring for Jamaican crotons is simple, because these plants are low-maintenance and require only regular watering. With some extra care, however, you can enhance the leaf colors and make them brighter. Place your Jamaican croton in bright, high light. For the best leaf colors, keep the croton in full sunlight, such as in a sunny south-facing window or outdoors in direct sun during the warm summer months. Maintain air temperatures around your Jamaican croton of 60 to 85 degrees Fahrenheit. Keeping the air temperatures on the cooler end of this range will encourage brighter foliage colors. Water your Jamaican croton two or three times each week to thoroughly moisten the soil down to the roots. Don’t allow the soil to dry out, but instead keep the soil moist at all times. Feed your croton once each month with an all-purpose liquid houseplant fertilizer. Follow the dosage instructions on the fertilizer label. Prune your Jamaican croton by cutting the top of the stem back to the axil or joining leaf to keep the plant bushier. Keep the humidity levels elevated around your Jamaican croton. You can place the planter pot on top of a drainage dish filled with water and gravel to increase the humidity. You can grow the croton outdoors, if you live in a region with mild winters that doesn't experience temperatures that frequently dip below 40 degrees. Beware of the croton's sap, which can stain your clothes and possibly irritate your skin. Use caution when handling the Jamaican croton if its leaf is punctured or when you're pruning the plant.